The numbers behind personalisation - where do you stand? Personalisation is a massive topic for marketers at the moment. It’s the best way to engage customers and contacts with messaging and content that is tailored to suit them. 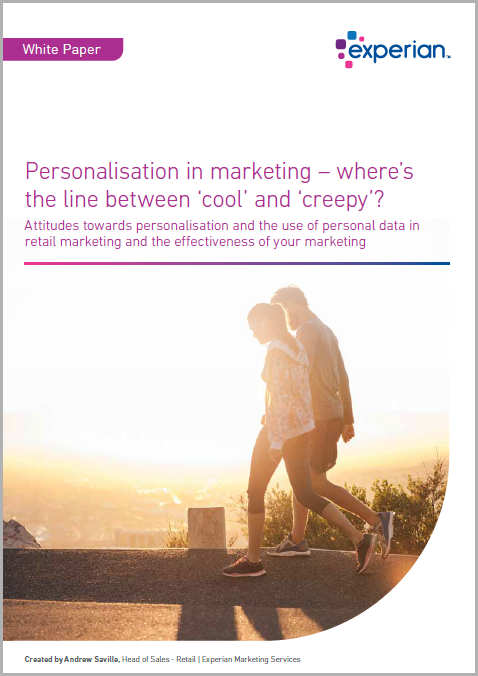 To this end I’ve pulled out some top level figures from our recent Personalisation Report to provide a clearer view of not only the need for personalisation but also of the level at which brands (your peers and competitors) are personalising at the moment. In the current marketplace marketers need to make their communications as personalised and individual as possible to cater for ever-increasing consumer expectations. In order to reach our desired audience and engage with them in a relevant and timely fashion we have to meet them on their terms. Essentially, there is no more ‘one size fits all’ marketing and personalisation is one of the best ways to increase the effectiveness and relevancy of your messages. According to the survey, 95% of people have made a purchase online in the past two years. Similarly, 36% have subscribed to an online service provider (such as a music or film streaming service) and 71% have actively used a social media network. What this means is that while’s there’s a huge potential audience there’s an awful lot of competing noise. Furthermore 69% of consumers receive emails from marketers every single day and 37% receive direct mail marketing on a weekly basis. That’s a lot of marketing messages. For our messages to be effective we need to make ourselves heard above this noise – and this is where the need for personalisation becomes evident. According to our 2015 Q2 email benchmark study, emails sent with personalised subject lines, including either first name, surname, or another unique identifier such as account number, were 7% more likely to be opened than emails sent with blanket subject lines. What’s more, because it works it’s catching on, with 86% of brands currently personalising their communications. Of course, there are different levels of personalisation ranging in complexity and sophistication. Fortunately the research we undertook for the 2015 Digital Marketer Report provided a more detailed breakdown. In the UK 61% of brands personalise with the most basic of personalisation techniques – addressing contacts with first or second names. Effective but not particularly complicated. The second most used personalisation technique is the usage of behavioural data, such as past or abandoned purchases, to tailor the customer experience to an individual – with 42% of brands doing so. It’s when we get to the more sophisticated techniques that the numbers drop off a slight cliff. Only 11% of marketers personalise using preference centre data – meaning 89% of UK marketers aren’t basing their communications on what their customers have indicated they’d like to receive. A fairly startling fact and more so when we consider that 21% of marketers are doing so. Similarly, only 9% of marketers personalise based on attitudinal data (such as whether customers are price sensitive or impulse buyers) which is one of the most complicated forms of personalisation – consisting of matching content types and messaging to consumer attitudes. It’s clearly these more sophisticated areas, where current uptake is less, that represent the best opportunity for brands to distinguish themselves. They do, of course, come with their own challenges (check out this infographic on the challenges facing personalisation for more). However, it’s at this point that I raise a warning flag. At the core of any decision on personalisation is the need to keep the customer first. The more sophisticated techniques require a fuller understanding of who your customers are and a robust and reliable set of data. Getting personalisation wrong can have disastrous results not only on an individual campaign but also on that contact’s perception of your brand. For instance, it’s a bit embarrassing if you call someone by the wrong name (for more on the dangers of getting personalisation wrong download the report here). In summarising the main points of this article, personalisation represents a great chance for marketers to create interesting and relevant interactions with their contacts and customers – a necessity in the modern marketplace with its abundance of noise and demanding consumers. A lot of marketers are personalising and to great success, but there is a significant gap in the usage of the more sophisticated techniques. The brands which crack the sophisticated techniques and apply them responsibly and based on accurate and reliable data will reap the rewards. Experian Marketing Services is the leading global provider of consumer insights, data quality and cross-channel marketing. We help organisations intelligently interact with today’s empowered and hyper-connected consumers. By helping marketers identify best customers, find more, and then coordinate seamless and intelligent interactions across the most appropriate channels, Experian Marketing Services can deepen customer loyalty, strengthen brand advocacy and maximise profits.